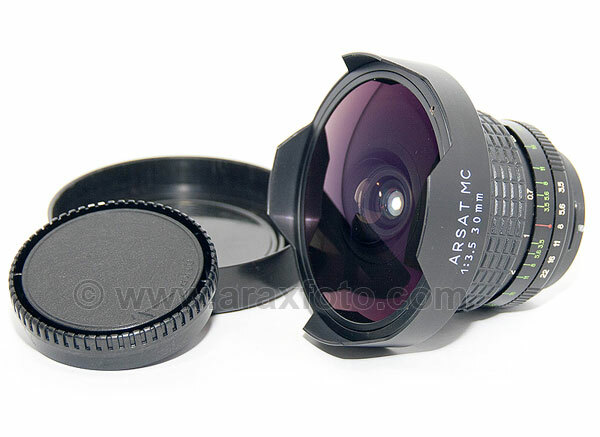 ARSAT(Zodiak-8), 3.5/30 superwide-angle lens for medium format Kiev camera. Lenses / ARSAT, 3.5/30 superwide-angle, fisheye. ARSAT(Zodiak-8), 3.5/30 superwide-angle, fisheye lens for ARAX. Selling includes lens with front and rear caps, 4x light filters, protective case. Famous perfect multicoated fisheye lens. Equals 16mm focal length in 35mm format. This lenses was produced in two versions and intended for medium format SLR cameras. Index ‘C’ (Б) for cameras of ARAX (Kiev-60, Pentacon-Six) mount and ‘В’ index for screw KIEV 88 mounts. 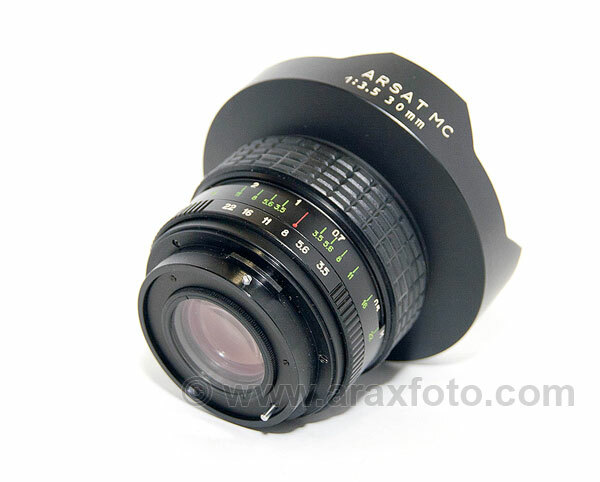 The lens manufacturing is finished in 1992 and now all lenses are second hand or refurbished by ARAX. The lenses with leather hard case had better optic elements, and were single coated from factory. After ARAX refurbishing they it has 7 layer multi coating (MC) and full one year warranty. Comes with 4 light filters: blue, orange, green-yellow and neutral (protective, already mounted on the lens); front and rear cap; protective case, English manual. The lens cannot be used without light filter! It comes with UV filter already installed on the rear side of lens.